The new Anchor Food Professionals brand on display at Fine Food Australia. 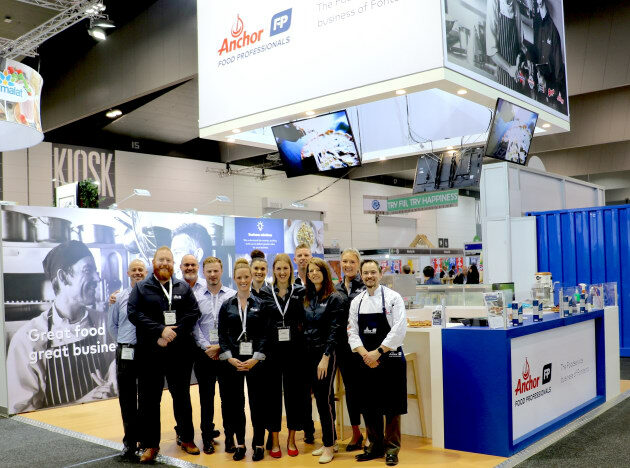 Fonterra Australia’s foodservice business has relaunched under a new name – Anchor Food Professionals. And while the name may be new, Anchor Food Professionals will still include such popular, dairy-focused foodservice brands as Perfect Italiano, Western Star, Mainland, Anchor and Bega. The change comes as Fonterra readies itself to capitalise on the growing, global foodservice market, which is predicted to be valued US$3 trillion by 2021. Furthermore, director of foodservice, Jeff Dhu, sees the Anchor Food Professionals brand as being better suited to meet customer needs and demonstrate innovation within Australia as well as internationally. “Anchor Food Professionals not only represents the world-class dairy products that we make for restaurants, cafés and quick service restaurants across the country, it also signifies the deep expertise of our people and the focus on performance and business solutions that we bring to the table," he says.